We’re extremely happy to announce the immediate availability of PeepSo 1.8.4! It’s a great release that brings a lot of new features. The main focus was put on the BlogPosts plugin as you can see in the changelog. But it’s not the only one getting new features or improvements. Without further ado let’s get to the fun stuff! Can people write blogposts via your plugin? And our answer has always been: no, there’s no point to reinvent the wheel. But we found a great plugin by CM developers: User Submitted Posts that already allows that. So we integrated it with our BlogPosts plugin. 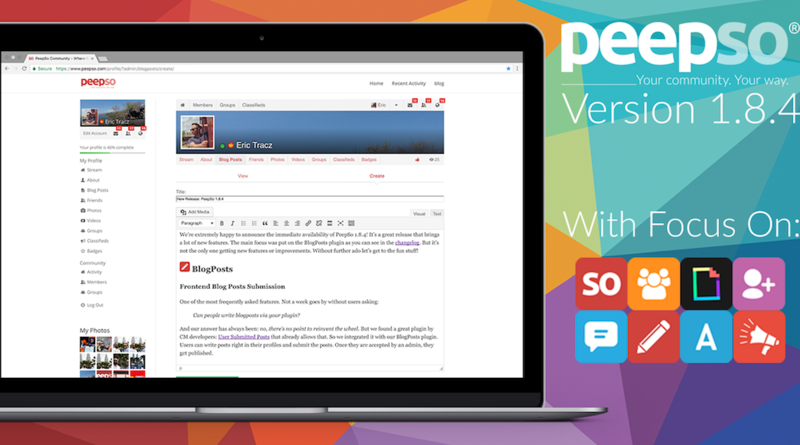 Users can write posts right in their profiles and submit the posts. Once they are accepted by an admin, they get published. 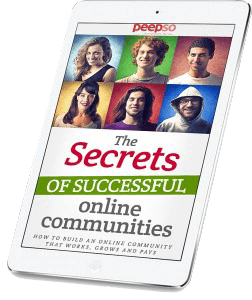 New setting has been added to PeepSo BlogPosts. Right now you can decide what to say to tell people to login, comment or react to the post. You’ll find this setting, just like the other ones for the plugin in the backend of your site: PeepSo > Configuration > BlogPosts tab. These are essential for PeepSo to work properly and will save a lot of time for both people who want to use it and our support. We still sometimes get support questions and complaints that PeepSo still from time to time we get someone who says that PeepSo doesn’t work, we check and they’re using PHP 5.3 which support ended 3 years ago. We’ve added a completely new notification engine. Before this version whenever you viewed your notifications they all got marked as read. Right now you only those notifications that are actually clicked are being marked as read, not all of them. No more lost or missed notifications and all of that done live. This is a brand new and at this point experimental feature – which means it should NOT be used on a production site. It’s to be found in Backend > PeepSo > Configuration > Advanced. It will remove “?” from certain PeepSo URLs, such as “profile/?username/about”. It has its limitations for example if you set PeepSo as your home page, single activity view will still have the “?” in the URL. As well as if you’re using plugins that ‘catch’ 404 pages it might not work great in some scenarios. There are too many conditions for us to be able to find all of them so if you find any problems on your staging sites, please do contact us about those problems and we’ll add fixes as we go. We’ve integrated WPAdverts further with PeepSo plugins and right now any logged in user can start a conversation via Chat directly from Classified ad listing. Either from the general directory in PeepSo or from the Activity Stream posting. Another way to get in touch instead of phone and email. New content rating setting. You can set the maximum rating for GIPHY gifs for your site. If you run a site for kids or teenagers it might be a great idea to limit the explicit content. The following options are to be found in the backend > PeepSo > Configuration > GIPHY tab. Many have been asking us how to make the size of the profile and group covers full at all times regardless of the tab viewed. We’ve added a setting to PeepSo > Configuration > Appearance. Go ahead and flip the switch if you want to have full cover view. PeepSo 1.8.4 is one of a few upcoming releases that’s focusing on cleaning up our backlog from all the smaller improvements and features that we’ve been asked to add for quite some time but never found the time to actually do it. You can see what else has been improved and fixed in our changelog. Should you experience any issues with upgrades, simply go to the backend of your site > Dashboard > Updates, select all PeepSo plugins that need to be updated and click ‘Update Plugins’. Once that’s done, refresh the page and make sure to update PeepSo Core plugin as well. When that’s finished go to: Plugins list and just double check that all plugins are active. If not, simply select and activate the plugins. Should you have any issues or questions, please do contact us. Love the 1.8.4 updates, thank you PeepSo team!!! Hey gang, This issue might pre-date 1.8.4 but my New Messages icon (envelope) continually shows '1' when I have opened all messages. This is on my site, not here. Anybody else having that problem?